I've been so focused on watching my cherry tomato plant (which is doing fine by the way) that I've completely missed what was going on with the celebrity tomatoes. It's hard to tell from the above photo, but not a lot of new fruit has set. The celebrity tomatoes look fine from a distance, but when you get a closer look a lot of the flowers look like the photo below. I did some googling and I suspect it might be gray mold. This fungus disease is intriguing in that it can cause a variety of plant diseases including damping-off and blights of flowers, fruits, stems, and foliage of many vegetables and ornamentals. It is a major cause of postharvest rot of perishable plant produce, including tomatoes at harvest and in storage. 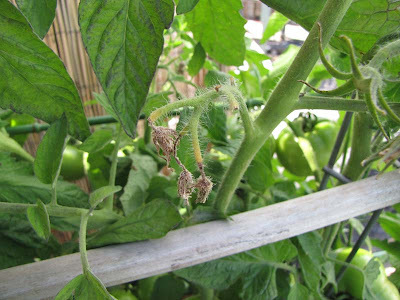 The disease can occur both in the greenhouse and in the field. 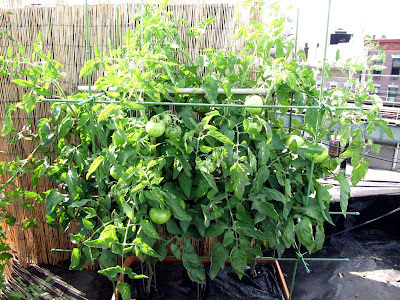 Besides tomato, gray mold is of concern to other vegetables including snap and lima beans, cabbage, lettuce and endive, muskmelon, pea, pepper, and potato. High relative humidities are necessary for prolific spore production. In the field, spores landing on tomato plants germinate and produce an infection when free water from rain, dew, fog, or irrigation occurs on the plant surface. Optimum temperatures for infection are between 65° and 75° F (18° and 24° C), and infection can occur within 5 hours. High temperatures, above 82° F (28° C), suppress growth and spore production. Dying flowers are a favorable site for infection, but infections can also result from direct contact with moist infested soil or plant debris. There's not much I can do about what's there now, but I have some neem I can use to prevent it from spreading. Fingers crossed. I also bought lime to add to their container, hopefully that will end the blossom end rot.